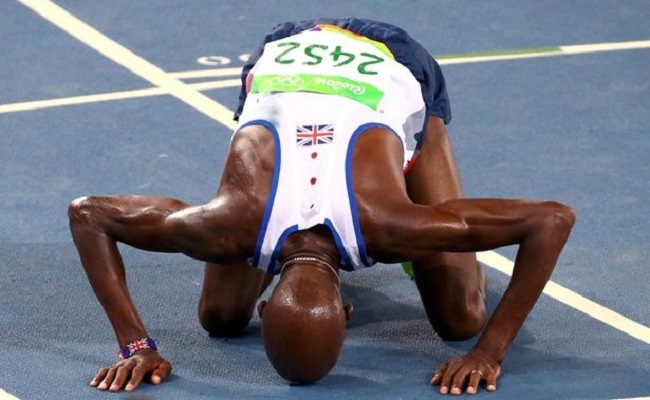 Mo Farah prostrates to Allah [swt] after winning in Rio. Some people say the hardest thing to do in sports is to win when you’re expected to win. Right now in Rio de Janeiro, Brazil, there are a handful of athletes who have been marketed and advertised as the marquee names of the 2016 Summer Olympics, and most of them are heavily favored to win multiple gold medals. Two of those athletes — United States swimmer Michael Phelps and U.S. gymnast Simone Biles — have already faced those expectations and delivered. A third, track and field star Mo Farah of Great Britain, is now halfway toward doing what everyone expects him to do in Rio, which is pull off an Olympic double-gold repeat performance. He did it by winning Saturday’s final of the men’s 10,000-meter race to claim the third Olympic gold medal of his storied career. After earning gold in the 5,000-meter race and silver in the 10,000 meters at the 2011 World Championships in South Korea, Farah entered the 2012 Olympics in London as the favorite to win both of his specialty races on his home soil. He did not disappoint. And since then, Farah has been unbeatable at major-championship meets. 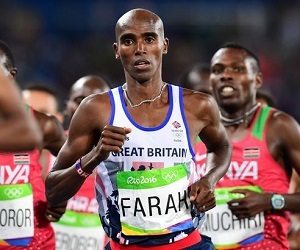 Farah won gold in the 5,000 meters and 10,000 meters at the 2013 World Championships in Moscow, then repeated the feat at the 2015 World Championships in Beijing. Anything less than a gold-medal sweep in Rio would be considered a letdown. A loss for Farah would be considered a monumental upset for whoever beat him. But so far, doubling in Rio has not been easy. Nine laps into Saturday’s 25-lapper, Farah was tripped unintentionally by medal contender Galen Rupp of the U.S. and fell to the track. The 33-year-old Farah had to get up and catch up to the pack, then navigate his way through the field of 33 other world-class runners to get back to the front. Farah was in the lead going into the final lap, then he got passed by Paul Kipngetich Tanui of Kenya, then he passed him up again, and then Farah hung on for the victory with a time of 27 minutes and 5.17 seconds. Tanui won the silver medal, while Tamirat Tola of Ethiopia took the bronze. Farah, a devout Muslim, celebrated the victory as he usually does: First by making the “Mo-Bot” symbol upon crossing the finish line, and then by prostrating on the track to Allah [swt]. Next up on Farah’s schedule is the 5,000 meters. Opening heats for that race will be on Wednesday, Aug. 17, and the final is on Saturday, Aug. 20. If he wins another gold medal, Farah would become the first runner to accomplish the “double double” since Lasse Viren of Finland, who won the 5,000 meters and 10,000 meters at the Olympics in 1972 and 1976.